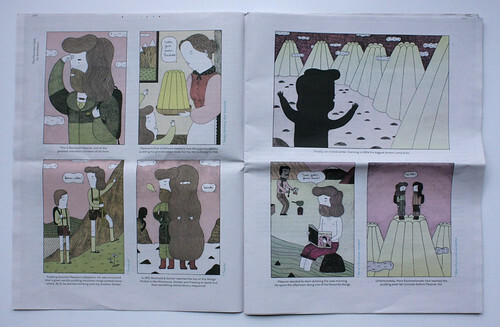 Printed on newsprint by Bolt Editions, the quarterly publication, aimed at eight- to thirteen-year-olds, is loosely based on the structure of traditional newspapers (rather than magazines) and covers finance, culture and food, among other topics. An abundance of illustrations, comics and photographic features are complimented by Martin McGrath’s print design – white space allows playful imagery to be interpreted with a level of maturity. 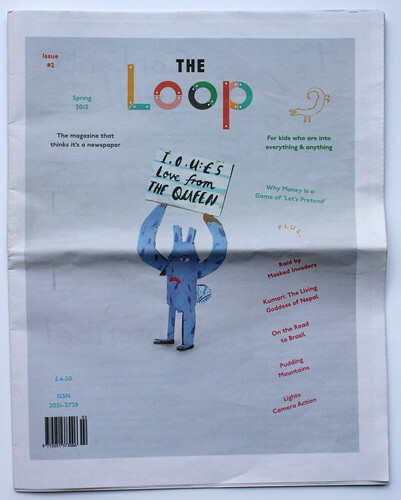 Cover image by Laura Bird from The Loop issue #2. 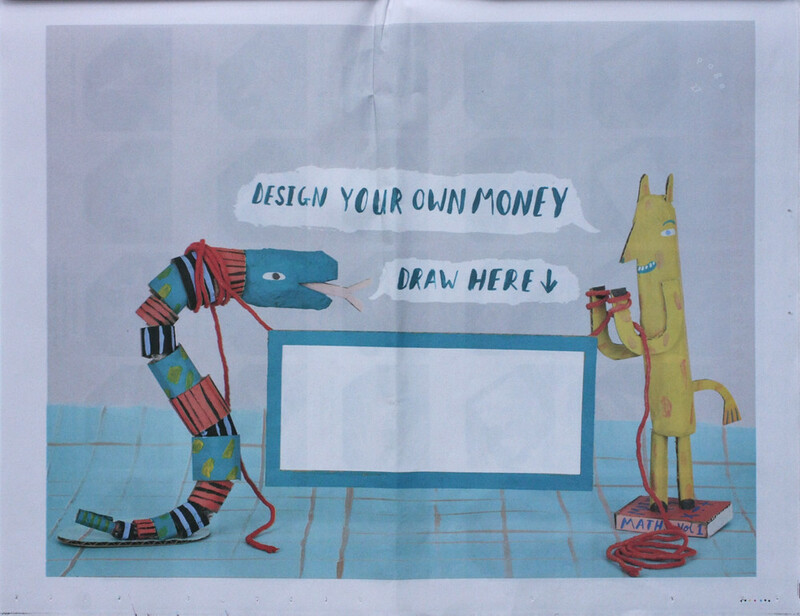 Top: spread from ‘Why money is a game of “let’s pretend”’ illustrated by Laura Bird. To help evaluate the publication, I sought the opinions of Iris and Jasmine, two thirteen-year-old girls from south London. The young critics were an apt choice, having skipped an after-school creative writing club for the occasion. ‘The mountain calls’ by Ana Albero, with captions in German and English. This comic series by Mili Banerjee runs in every issue. Activities in The Loop range from drawing self-portraits to sprouting mung beans to use in cooking homemade Japanese spring rolls. Others are more educational: comparing national borders on maps; using architectural principles to design a house; drawing a ‘nano-machine’. The crossword puzzle in the back of the publication is a kind of quiz, deriving clues from the preceding content. 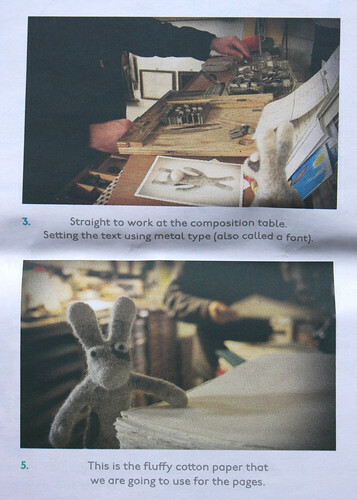 Spread from ‘Little Bunny: The Making of His First Book’. The feature plots setting type, printing and binding a book with Alberto, an Italian letterpress printer in Osnago. Issue one reviews photos from James Mollison’s book, Where Children Sleep (see ‘Show and tell’ by Karla Hammer in Eye 82). In the centrefold of The Loop issue two are colourful photographs of birds against bright backdrops. Taken from Luke Stephenson’s An Incomplete Dictionary of Showbirds (Stephenson, £20), the vibrant spread could be mounted as a poster on a bedroom wall. Both are examples of mature content that is conscientiously reviewed for children. 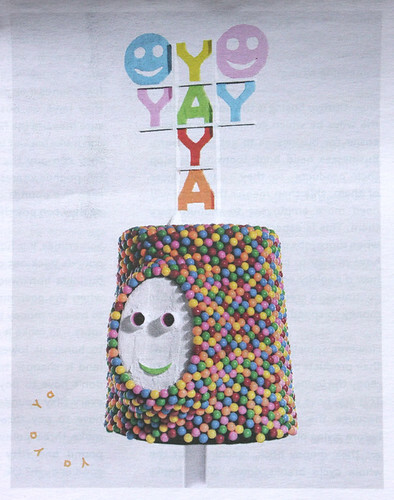 Ya ya ya, an edible mask by graphic designer Damien Poulain from The Loop no. 1. All other images from The Loop no. 2.